(Nanowerk News) Can an industrial robot succeed both at removing the breast fillet from a chicken, and at the same time get more out of the raw materials? This is one of the questions to which researchers working on the CYCLE project now have the answer. They have built a fully-functional robot in the lab to automate the process of extracting breast fillets from chickens. This is a task normally performed by skilled human hands. "Our aim is to automate absolutely everything we can think of on the food production line", says Ekrem Misimi at SINTEF. This will make Norwegian food production more sustainable, both in terms of profitability and utilisation of raw materials. This is the team behind the robot "Gribbot ", who has a special eye for chicken. From the left: Elling Ruud Øye, Ekrem Misimi and Aleksander Eilertsen at SINTEF. Ekrem is a technical cyberneticist with a doctoral degree in machine vision, and has specialised in providing robots with sharp, three-dimensional vision – which in this case means eyes for the anatomy of a chicken. "Automating this process is something that no one else in the world has succeeded in doing before. Except us", says Misimi proudly. "We at SINTEF are the only specialists in Norway to have focused on solving these kinds of problems for the food industry", he adds. So far, one of our results is the robot Gribbot, named because of its resemblance to a vulture's beak ('gribb' is the Norwegian for vulture). Gribbot is well equipped. It has a hand for grasping, specially developed 'fingers', and three-dimensional vision. Its 'eyes' have been borrowed from a 3D camera familiar to all games fans – the Microsoft Kinect 2. These are all needed because a chicken fillet is a delicate object that must be handled extremely carefully. The robotic hand must not spoil it with marks or other quality defects. Both the robot's vision and its grasping hand are critical factors. "Generally speaking, it’s a major challenge to get a robot to process biological raw materials, because it involves automating a task that is normally performed by skilled people. The raw materials also vary in terms of their size and properties. It’s easy to deform or damage a chicken fillet", explains Misimi. And because it’s so smooth, a chicken fillet is also an extremely reflective object. That makes it difficult to obtain fully detailed 3D images. The texture also means that the meat is hard to grip. "We realised this early on when we began our research, and were determined to develop a flexible system that could not only tackle variations in the raw materials, but also the mechanical challenges of extracting the fillet from the chicken", says Misimi. Naturally, controlling the robot is a key factor. The algorithm, or mathematical computational model, that constitutes the brain of the robot has also been developed by SINTEF. It is this that enables the robot to perform the operation to the same standard as a human being. If the robot's arm is to be guided precisely to the raw materials with the aid of 3D images, it is essential for the camera (the robot’s eyes) and the robot itself to 'speak the same language'. In order to address this problem, the robot is pre-calibrated to ensure that its 'hand' and 'eye' understand each other. Gribbot has been developed as part of a larger project called CYCLE. Its main aim is to make Norwegian food production, including fish, vegetables and meat, more profitable, more environmentally friendly and more efficient. In other words – more sustainable. "The fact is that almost half the food currently produced never reaches the consumer because it is lost along the production line due to the fact that we don’t have the technology to process the raw materials", says Misimi. "Automating this work will speed up production and make it more efficient. It will free up the producer's capacity and make better use of the raw materials. In the case of chicken fillets, this also means making optimum use of the material. A flexible grasping tool scrapes the carcass while it is pulling off the fillet, and this removes as much of the meat as possible", explains Misimi. 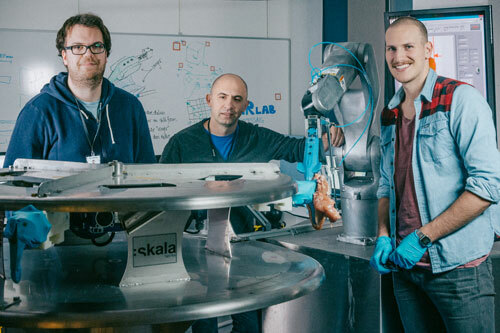 The idea is to continue developing Gribbot as part of future projects, so that it will be possible to make use of any meat that may be left on the chicken carcass after the fillet has been 'harvested' by the robot.